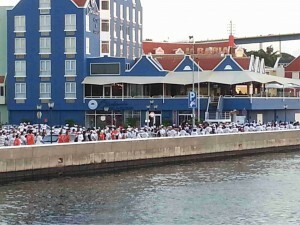 WILLEMSTAD - The auction of Hotel Otrobanda has been stopped temporarily. It was supposed to take place today, but the judge put a stop to it yesterday. The owners, the Eustatia family itself has found investors who want to pay the debts. In total there is an amount of 3 million guilders in debt. If the settlement with the largest creditor fails, the Giro Bank will try again to auction the hotel.